Advanced Micro Devices (NASDAQ:AMD) set the pace, losing 8.6%, though Nvidia (NASDAQ:NVDA) wasn’t far behind with a loss of 6.8%. Neither company did anything wrong. Rather, the two high-profile tech names were simply seen as the biggest liabilities should the broad market melt down the way many investors fear it will from here. And yet, there were some solid winners. Marijuana stock Cronos Group (NASDAQ:CRON) jumped 21.7% on news that cigarette giant Altria Group (NYSE:MO) was acquiring a major stake in the Canadian company. The wild swings of last week have mostly obliterated and budding technical trends. The stock charts of HollyFrontier (NYSE:HFC), PPL (NYSE:PPL) and Intuit (NASDAQ:INTU), however, still look like they’re moving into situations with a plausible, discernible outcome. To be fair, the movement here has likely got more to do with a sweeping move into more defensive area like utility stocks rather than PPL itself. Nevertheless, PPL shares have the most to gain for a sector-specific undertow. 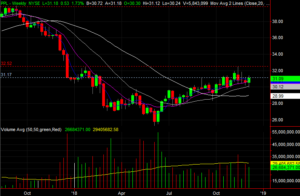 Click to Enlarge • PPL tried to break above a key resistance line in early November, but that effort failed. That’s OK though. The second attempt to push above the technical ceiling at $31.16 is more apt to last. 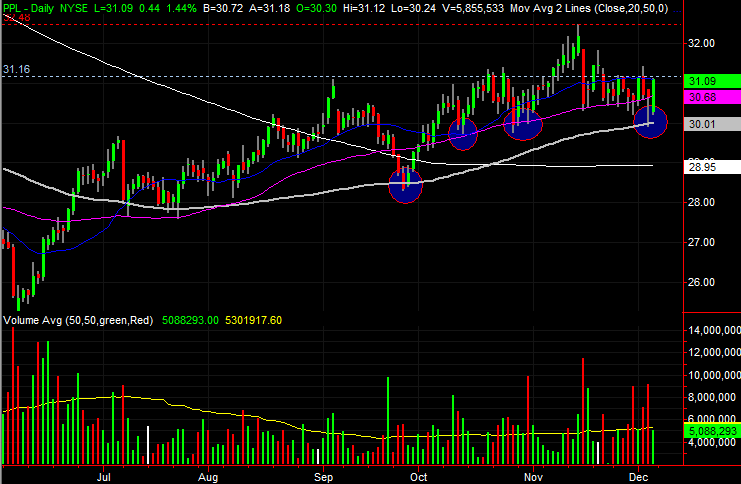 • Even after the mid-November pullback, PPL shares found support at the purple 50-day moving average line. Thursday’s brush of the gray 100-day average, however, may have hit the proverbial ‘reset’ button. • Note than last month’s peak near $32.50 matches the January high. 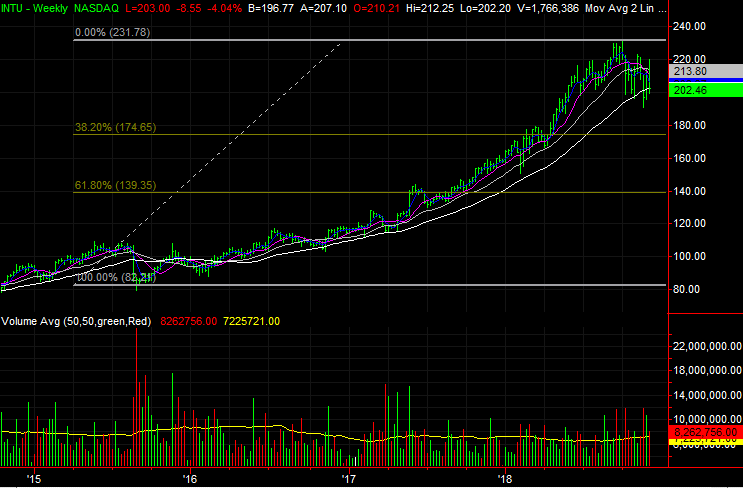 If this move gains traction, look for turbulence there again. 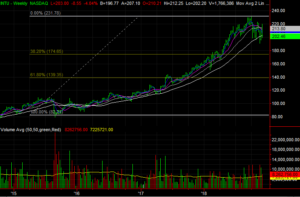 Three weeks ago we took a look at Intuit’s test of its 200-day moving average line as a support area. 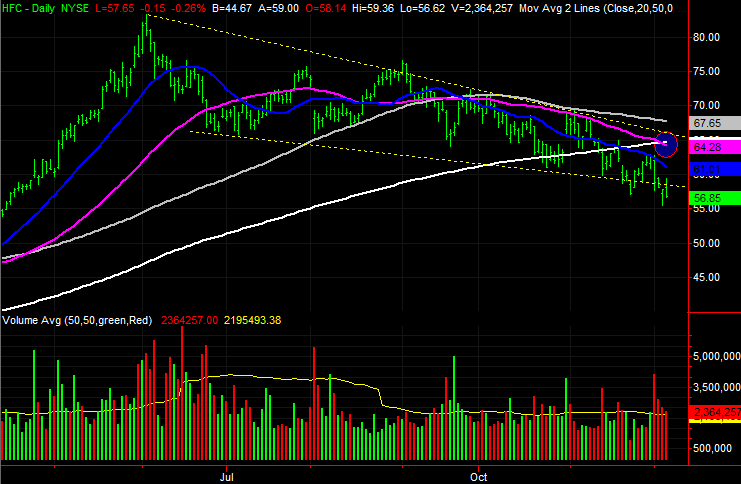 The stock ended up breaking below that floor, but bounced later that month to negate that bearish clue. The bearish possibility is back on the table, however. With a test of a now-established falling resistance line and a new test of the 200-day moving average as a floor, INTU is once again one bad day away from a break under a key support level. The second time it happens may not end as easily as the first one did. 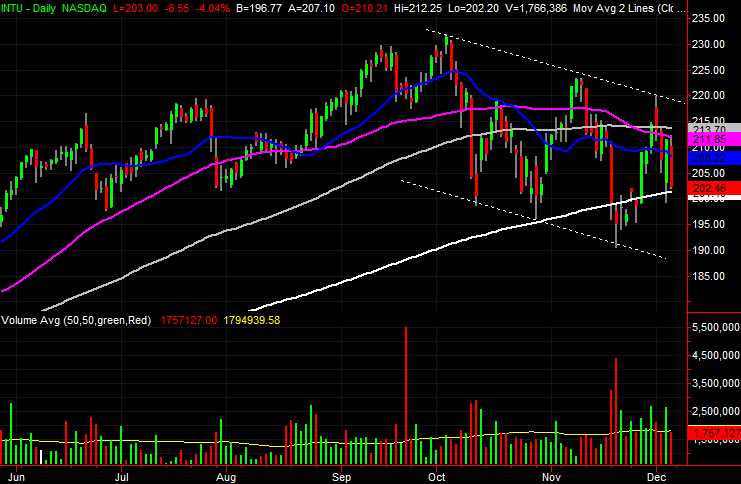 Click to Enlarge • The 200-day moving average line is plotted in white on both stock charts. 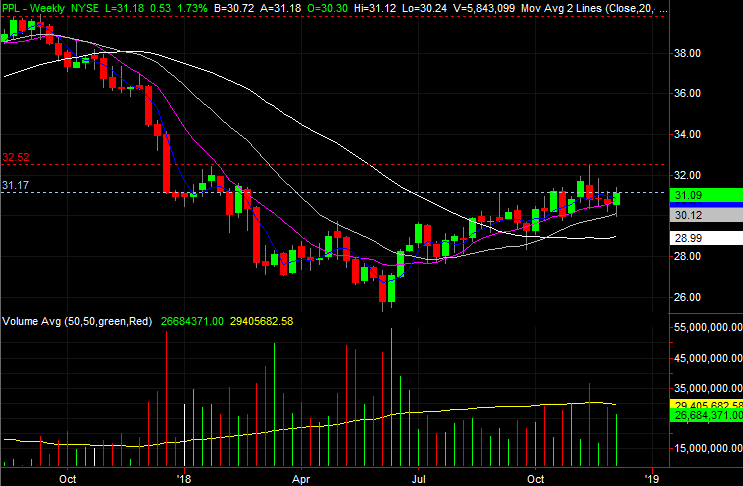 Friday’s close of $202.46 is just above that long-term moving average, currently at $201.40. • Though not yet below the 200-day line, in the meantime we’ve seen bearish crosses of all the other key moving averages. • Should the support at the 200-day average fail to hold Intuit up, the next likely landing point is the 38.2% Fibonacci retracement at $174.65. Finally, HollyFrontier is another name we’ve looked at of late, pointing out on Nov. 14 that the downtrend was gaining steam and slipping into a more bearish technical situation. That’s how things panned out. But, as of this past week, its technical backdrop has gone from bad to worse. Click to Enlarge• Already trapped in a downtrend framed by the yellow dashed lines on the daily chart, the recent weakness has pulled HFC below the lower edge of that range. • HollyFrontier is not only now well below its white 200-day moving average line, the purple 50-day line has also fallen below the 200-day average. 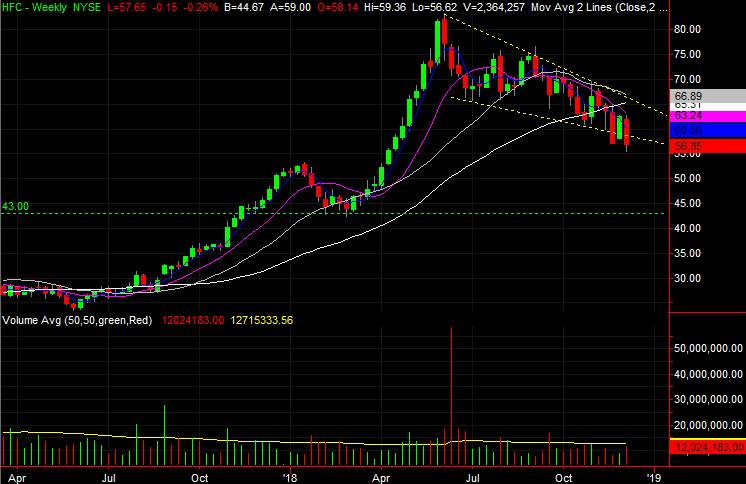 This so-called death cross suggests the bigger-picture tide has turned quite bearish. • If this weakness is allowed to fester and chip away at the stock, the most likely next floor is around $43, where HFC made a major low earlier in the year. Article printed from InvestorPlace Media, https://investorplace.com/2018/12/3-big-stock-charts-for-monday-intuit-ppl-and-hollyfrontier/.